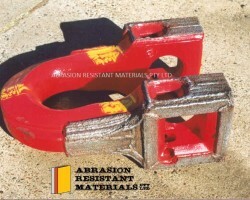 Yes, we can ARM Hardface dragline chain. 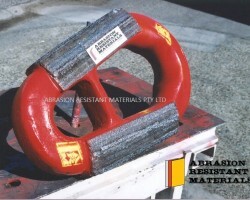 Our first trial on this delivered double the life of the standard chains – for only a 50% increase in cost (from new). Given these chains weigh between 4 & 7 tonnes each, ARM Hardfacing is considered a safe and cost effective alternative to common industry practices - such as rotating & end-for-ending - that aim to extend the dragline chain wear life. ARM dragline welding jig using 2 systems .. 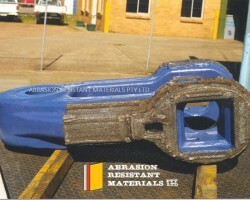 ARM lifting jig for dragline chain ..
Preheat management - pupose built 10m long burners .. ARM pattern for dragline chain - compared to other Chromium options ..
Pear end link wear shows why ARM hardfacing options are required .. ARM hardfacing on ESCO Pair End Link ..
An early (successful) experiment at BAC on a pear end link. 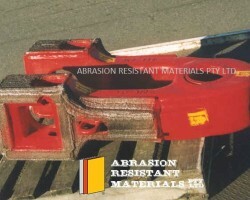 ..
Crutches hardfacing with manganese by ARM .. 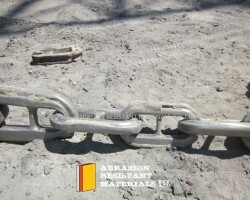 ARM hardfaced ESCO dragline chain .. ARM hardfaced dragline chain after 4.0 Million BCM .. 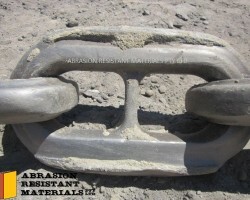 ARM dragline chain wear after 4.0 Million BCM - the only wear is on the non hardfaced links ..
Large drag shackle - ARM hardfaced ..
Large ESCO drag shackle ARM hardfaced ..
Small ESCO hitch shackle ..